Write Angles May 2013	Announcing our 5th Grade Contest Winners! We are delighted to welcome New York Times Bestselling Author Julia Flynn Siler to our Speaker Series! 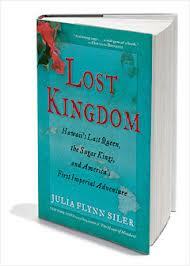 Lost Kingdom: Hawaii’s Last Queen, the Sugar Kings, and America’s First Imperial Adventure brings to life the clash between a vulnerable Polynesian people and expanding capitalist powers. At the center of the story is Lili’uokalani, the last queen of Hawaii. The story begins around 200 A.D., when intrepid Polynesians navigated thousands of miles across the Pacific and arrived at an undisturbed archipelago. For centuries, their descendants lived with almost no contact from the Western world. In 1778 their isolation was shattered with the arrival of Captain Cook and his men. Lost Kingdom deftly weaves together a memorable cast of characters. Julia Flynn Siler is a prize-winning author and journalist. Grove/Atlantic published Lost Kingdom in early 2013. Her first book was The New York Times bestseller, The House of Mondavi. As a veteran correspondent for the Wall Street Journal and Business Week, Ms. Flynn Siler spent more than two decades in Europe and the United States. A graduate of Brown University and Columbia University’s Graduate School of Journalism, she also earned an MBA from Northwestern’s Kellogg Graduate School of Management. The CWC Author Reading will be Kristen Caven presenting her new YA novella (about a different kind of queen), The Souls of Her Feet.